Infiniti is renaming all of their cars with the letter Q followed by some numbers. Ok. Cool. 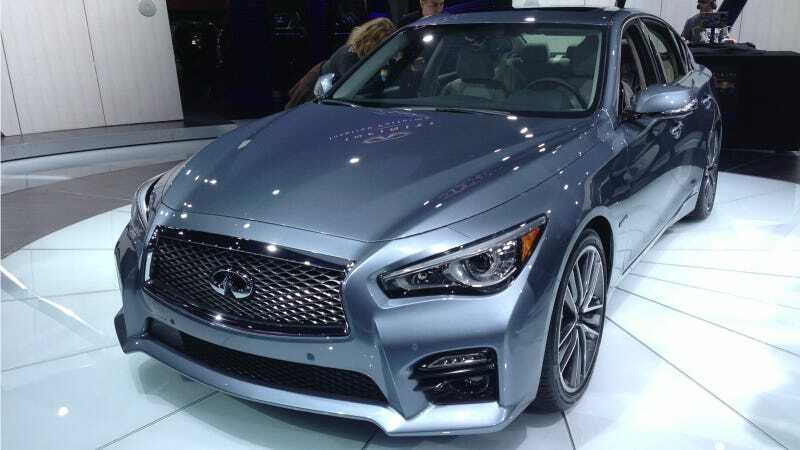 The 2014 Infiniti Q50 sedan is replacing the G37 sedan. Ok. Cool. Infiniti has now said they're going to sell both of them at the same time. Ok... Wait. What? In a conversation with Autoblog, Infiniti confirmed that once they start selling the Q50 they will continue to have it alongside the G37 on showroom floors, at least for the next year. The reasoning is that the Q50 is moving upmarket slightly from the G37, so there is room for both on showroom floors. What's funny is that while the Q50 moves upmarket, it starts at $37,605, about $600 less than the current G37. That probably means a pretty substantial price cut is coming for the G37 as it moves downmarket. It's unclear how long the G37 will stay on sale, or if it'll be renamed Q40 or something to maybe make people a little less confused. Or more confused? Who knows these days.